Amelia is approached by a woman who is concerned about the son she gave up for adoption sixteen years ago. Millie has been having nightmares that make her fear he is in danger. She petitioned the court to view the sealed records but was refused. Will Amelia and rick be able to convince the courts to help them? If her son is in danger, will they get there in time? So Rick and Amelia have finally tied the knot in this book. Readers may know that there has been a simmering romance between these two in the last few books in the Amelia Moore Detective Series. Mr. And Mrs. Rick Bonito are partners in a private detective agency specializing in missing persons. In this episode, Amelia and Rick are looking for an adopted child who may have a serious genetic disorder. Since the court won't reveal the identity of the adoptive parents, Amelia and Rick face a challenge. 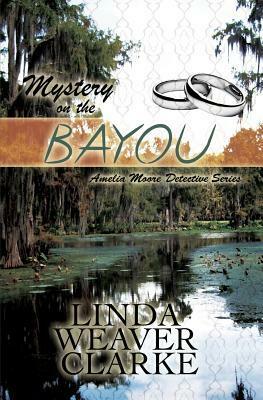 In pursuit of a lead, they travel to bayou country - Louisiana, USA. Curious twists and turns await them, including the disappearance of 3 teenagers following the homicide of a police officer in an Asian neighborhood. To quote from the book "....we have a missing boy, gang members, a murder, a kidnapping, and Tom's kayak floating down the bayou." The food (gumbo, crawdads, and jambalaya) and the description of the bayous with the swamps and Spanish moss make the story authentic. Rick and Amelia are engaging young married sleuths, full of heart. The author has done a wonderful job of their character development. I like them. Each time I read this author I learn something and this book is no exception as she educates the reader about Marfan's syndrome. As usual, I recommend this clean, romantic mystery. Disclosure from Sandra: Thanks to Linda Weaver Clarke from for sending me this book for review. I was not compensated in any other way, nor told how to rate or review this product. Linda Weaver Clarke travels throughout the United States, teaching people to write their family history and autobiography at libraries. She has traveled to seventeen states and given over 500 workshops. She is the author of historical sweet romances, mystery/suspense, a children's book, and a cozy mystery series.